Yes, I liked The Next Generation beginning in season three. But my favorite series was Voyager. Despite the ludicrously PC casting, Voyager simply had excellent stories. I found the Borg, which featured prominently in both series, to be one of the Star Trek universe’s most imaginative creations. Deep Space Nine was worth a single run through, but Enterprise was a major disappointment, although the season three story arc was interesting. I doubt that I will bother to watch a new series, should one appear. As for the movies, the best part of the first movie was Jerry Goldsmith’s wonderful music. Only The Wrath of Khan and The Undiscovered Country play like something more than padded-out TV episodes. The fourth and fifth movies were ludicrous. None of The Next Generation movies made much of an impression. In fact, I think I missed one or two of them entirely. Then came Jar Jar Abrams’ incompetent big-screen reboot of the original series, including his totally needless remake of The Wrath of Khan. And now we have the thirteenth movie in the franchise, Star Trek: Beyond, helmed by Chinese director Justin Lin. 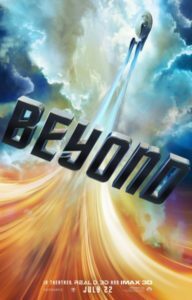 Beyond is the most visually impressive Star Trek movie ever. But the dazzling spectacle only underscores the hollowness of the plot. The villain, Krall, is a Star Fleet captain marooned for 100 years on a desert planet who has for some reason morphed into an alien, and then just as inexplicably morphs back to being human. During his exile, he has prolonged his existence by draining the life forces of sentient beings; he has conjured up a vast alien army; and he has nursed a plot to wreak havoc on the Federation because they stand for peace and unity (what, no diversity? ), whereas he stands for struggle and stuff. He is a former soldier, you see, whereas Star Fleet is basically an interstellar Peace Corps. He acquires an ancient Macguffin, a bioweapon that can destroy all life within its reach, and sets out to extinguish the millions of souls on Starbase Yorktown. I guess that’ll show them. (Of course his vast fleet of ships could do the same thing without the weapon, but never mind.) Naturally, though, he is stopped by the plucky crew of the Enterprise under the command of Captain Kirk (played by the handsome Chris Pine, who is 75% less Jewish than William Shatner). As spectacle, it was dazzling, but as drama it left me cold. With all the money and technical skill at the director’s command, you’d think he would have secured a good script, with characterization and drama and a couple of twists to glue all the action sequences together. Hell, he could have stolen a better story from Shakespeare or Melville or countless Star Trek fan novels. But no. This being Star Trek, I of course expected Beyond to be pozzed with liberalism and multiculturalism. Of course, the cast is just one giant Star Wars cantina of diversity, but instead of a wretched hive of scum and villainy, we have physically superior specimens of all races idealistically devoted to the higher good. We do learn that Mr. Sulu is a homo with a partner (perhaps even a husband) and adopted daughter, both of whom are also Oriental. But the real surprise is that Spock’s relationship with Uhuru was on the rocks because in light of the destruction of Vulcan, it seemed logical to him to be making pure Vulcan babies rather than Vulcan-human half-breeds. Seems logical to me too and not a bad meme to propagate. About 15 minutes before the end of Beyond, I started thinking of the shortness of life and contemplated leaving. But I came to write a review, so I stayed to the end. I wonder, though, what I was hoping to find in this movie. What has sustained millions of fans through five mostly bad TV series and 13 overwhelmingly bad movies? Star Trek combines two incompatible worldviews, both of which appeal to large numbers of people. First, there is the Faustian quest for exploration and adventure, the desire to see mankind ascend to space and explore the universe. Part and parcel of Faustianism is the economic utopianism of Star Trek, in which unlimited clean energy and “the replicator” have basically abolished scarcity. Machines have put us all out of work, so mankind is free to perfect itself and explore the cosmos. (For more on this, see the essay “Money for Nothing .”) Faustianism is primarily a white thing, as whites for better and worse are largely responsible for the scientific and technological progress that we call modernization. This is what appeals to me about Star Trek. This is what kept me coming back. Second, there is liberalism, multiculturalism, and (literal) universalism, which assume that everybody in the universe (except the bad people who wish to cling to their eccentric identities), no matter how apparently different, is basically the same insofar as they can become part of a United Federation of Planets. Unfortunately, as we have discovered since Star Trek first debuted in 1966, Faustianism and multiculturalism are not compatible. The Apollo program was ferociously attacked by the Left, which wanted the money to go to uplift programs for non-whites. Trillions have been spent on such programs, to no real effect, whereas the same trillions of dollars could have taken us to Mars by now. One of the main spurs to technological progress is high labor costs. Only by keeping labor expensive will we arrive at a world in which machines put us all out of work. Thus economic globalization and open borders are undermining technological progress by creating a global plantation economy, in which “productivity” and profits rise simply by cutting labor costs rather than by technological improvements that actually make labor more productive. Globalization also inevitably causes First World living standards to plunge towards equalization with the Third World, destroying the white human and social capital that made progress possible in the first place. (See “The End of Globalization .”) If present trends continue, it will be homogeneous high-IQ Asian societies that rise to the stars while the white world descends into the mud of Third Worldization. Thus if you want to make Star Trek‘s Faustian utopia real, you need to put away liberalism, multiculturalism, and other childish things and devote yourself to the most serious cause of all: fighting for White Nationalism. Silly movies like Star Trek: Beyond have nothing to contribute to progress. They are just ways of amusing ourselves as we decline.